Use this spiraling vortex to decorate your wall space. 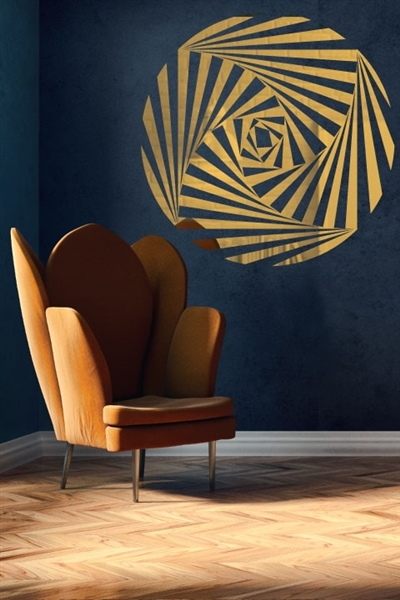 A great abstract design, our Optical Spiral Wall Decal is perfect for anyone who likes geometric and delicate designs. Optical Spiral shows alternating triangular shapes to form a circular pattern that appears to be moving in on its self (pictured in Gold). Our Reflective Optical Spiral Decal uses our reflective polyester film vinyl, which is very thin and will show blemishes easily below the surface. For decals over the 46in width, your decal will come in two parts or more.